The Trinity War crossover is slowly coming together. It all started when Pandora appeared in issues of the new 52, and from there it branched into developing the storylines of Justice League, Justice League Dark, and Justice League of America. These all lead up to the Trinity War after the Justice League’s satellite headquarters is bought down by Despero. Meanwhile, Amanda Waller and Steve Trevor gather their own Justice League of America to counter an out-of-control Justice League. With these explosive elements assembled, it is only a matter of time before something triggers their confrontation. Previously in Justice League: Billy Batson and his adopted family are on the run from Black Adam and the Seven Sins. With Adam seeking the power of Shazam, Billy’s quick thinking turns his family into superheroes. With the help of his family, Billy Batson is able to hold off Black Adam’s attack and rescue the people of Philadelphia from the Seven Sins. However, the power Billy gave to his family begins fading. With his family powerless, Billy tricks Black Adam to fight fair, without powers. Since Black Adam has not returned to his human form for many centuries, he ages into dust. Geoff John’s Justice League #22 starts off with Billy Batson, fresh from his victory over Black Adam and the Seven Sins. Hoping to bring closure to his ordeal, he travels to Kahndaq to bury Black Adam’s ashes. Although the country is off-limits to Americans, Billy follows in the footsteps of Superman and Wonder Woman who were in the country attempting to save hostages in issue #19. The story is narrated by Madam Xanadu, who uses magic to foretell the future, which allows the plot to jump from one event to another. Even though this brings all the events together, it is hard to tell if these events have already happened or they are going to happen. So far Trinity war is not just another crossover event. For example, with most crossover events, many comic books are represented, and some characters get lost in the background. Although some prominent heroes do not even speak in this issue, most heroes get a turn to contribute to the storyline. Also, for an introductory issue, Justice League #22 has quite a few twists and turns, including the death of a major DC character. The action and story is evenly paced and well-planned. One character surprisingly takes center stage in Trinity War: Superman. He apparently is the key to the Trinity War, connected to all the events as shown by the mysterious Question. Although his origin is different, the Question investigating Superman is a nice throwback to the Justice League Unlimited cartoon show. One problem with Justice League #22 is the ambiguous involvement of the Secret Society. It is unclear if they were planning all these events, or if this was the opportune moment to strike. If it was planned, many things needed to fall into place for their plan to work. After a short hiatus from Justice League, Ivan Reis returns to his duties as main artist for the series. He does a remarkable job keeping all the action and characters together in this issue. Ivan Reis makes every character unique by design, making it easy to identify each superhero. Fans will enjoy the fight between Superman and Shazam, which is a great homage to the battles they had before the reboot. In fact, the action sequences do not seem to stop, taking up most of the art. Although he only employs a double page spread once, it is a great piece of artwork and good choice for the scene: the Justice League of America finally confronting the Justice League. Overall, Ivan Reis’s art solidifies the impact of this crossover. 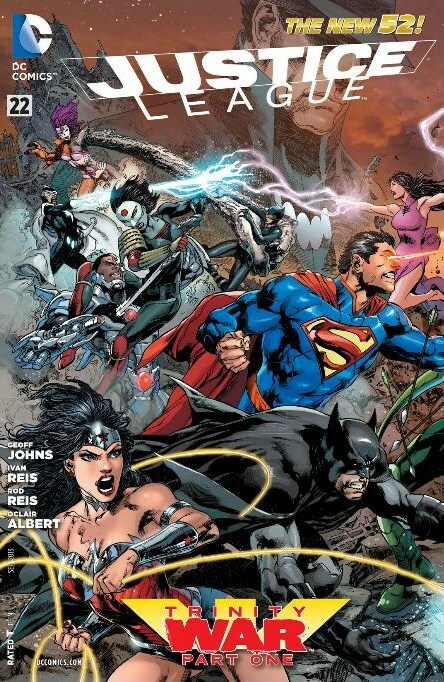 Geoff Johns and Ivan Reis combine to form a great creative team for Justice League. Although the ending is a little chaotic, overall Justice League #22 is a great start to DC Comics’ first crossover event since Flashpoint. With Justice League Dark about to join the fray, Trinity War is bound to change the shape of the DC Universe for years to come. Justice League #22 earns 4 out of 5 stars.